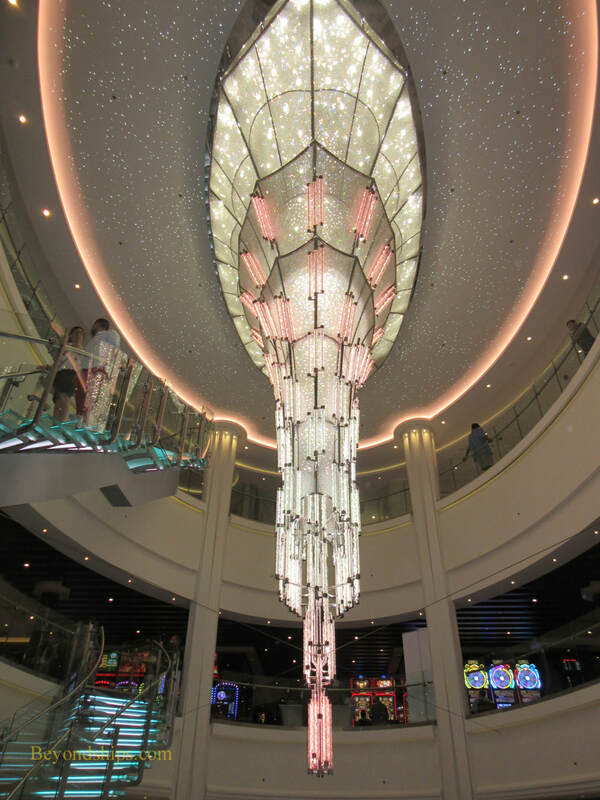 Above: A feature of each Norwegian ship since Norwegian Epic is a giant chandelier. During the course of the day, it changes color. 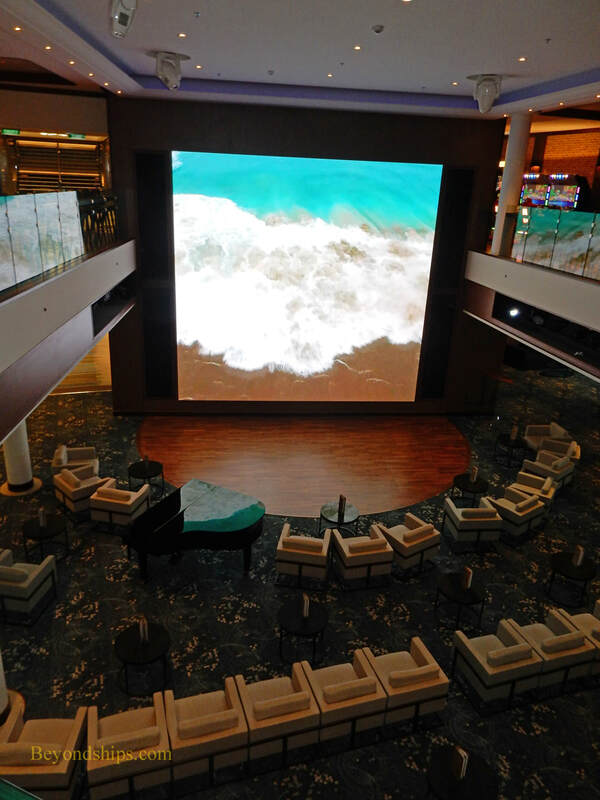 The Atrium with its giant video screen acts as the ship' living room. Located in the lobby, it is close to a bar, Starbucks and Guest Services. 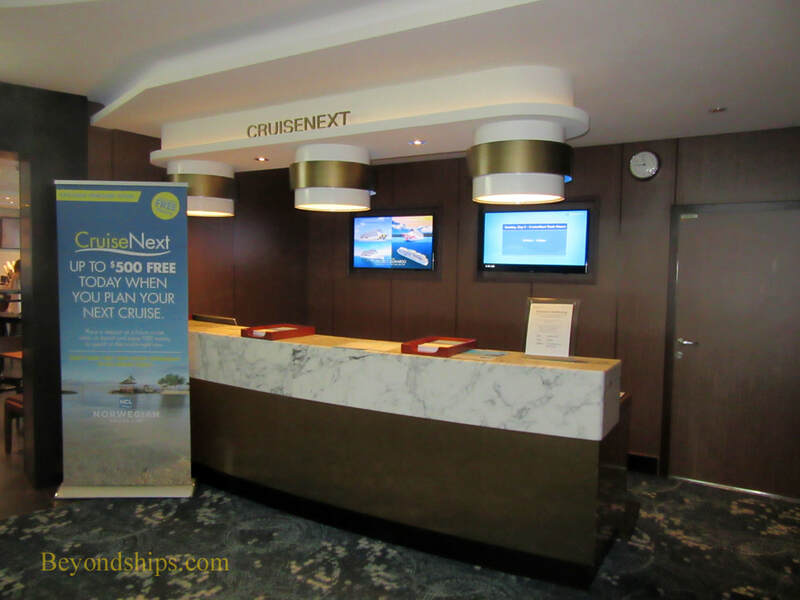 Norwegian Bliss is the third ship in Norwegian Cruise Line's Breakaway-Plus class. Her sister ships are Norwegian Escape and Norwegian Joy. 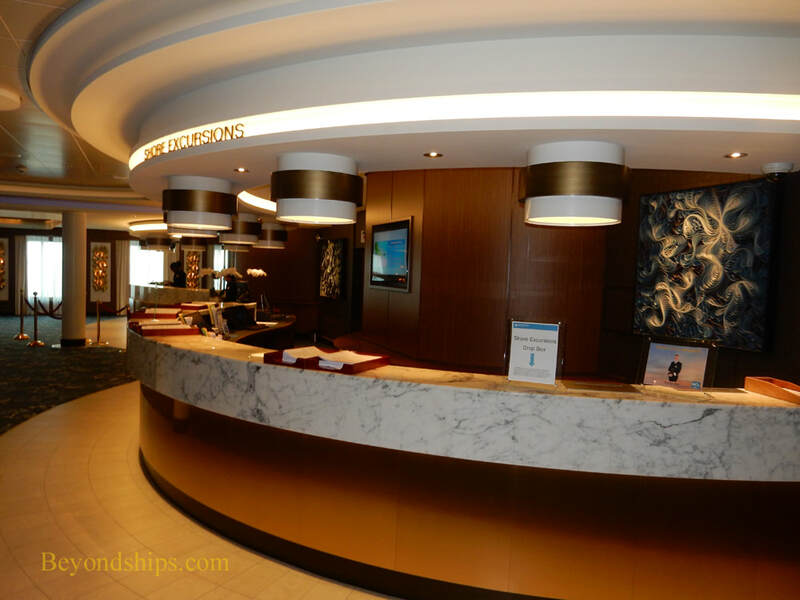 This class is a slightly larger version of the Breakaway class and so Norwegian Breakaway and Norwegian Getaway can be considered near sisters to Bliss. Although Bliss has a substantial number of predecessors, she is not a cookie-cutter copy. 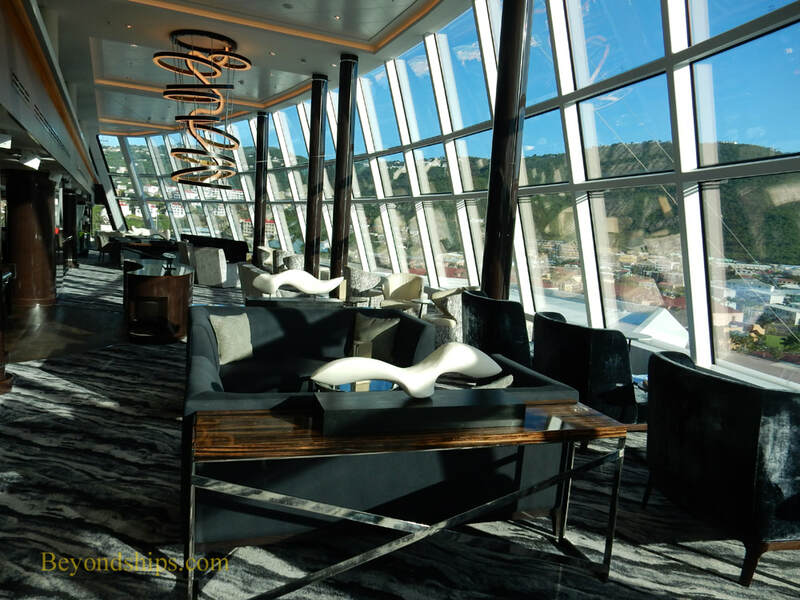 Envisioned as Norwegian's primary Alaska cruise ship, Bliss was built with an extensive observation lounge to enable guests to have panoramic views of the spectacular scenery. She also premiered several new dining venues. Her amusement park includes a go-cart racetrack and a laser tag arena, which are not found on her predecessors. 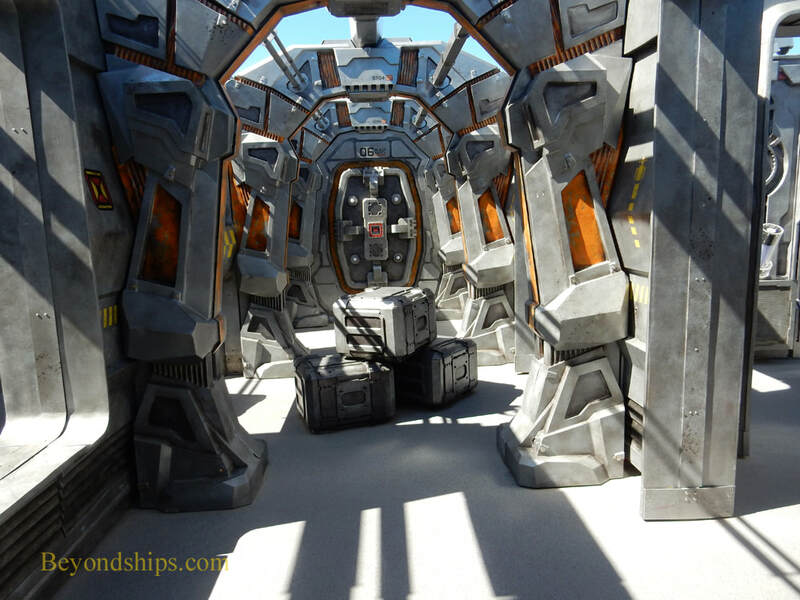 Even though Bliss is a large ship, space is not unlimited and so some familiar venues (e.g., the Moderno specialty restaurant and the ropes course) were eliminated to make room for new features. Also, the configuration of some of her decks is arranged somewhat differently. Overall, Bliss is a large resort ship. She is family-friendly. However, she also has features to appeal to travelers without children. For example, her extensive studio area, which includes not only solo cabins but a dedicated lounge, makes her solo-friendly as well. Among the innovations on Norwegian Bliss were its Observation Lounge and its Laser Tag arena. As is now customary on Norwegian ships, the hull is a work of art. 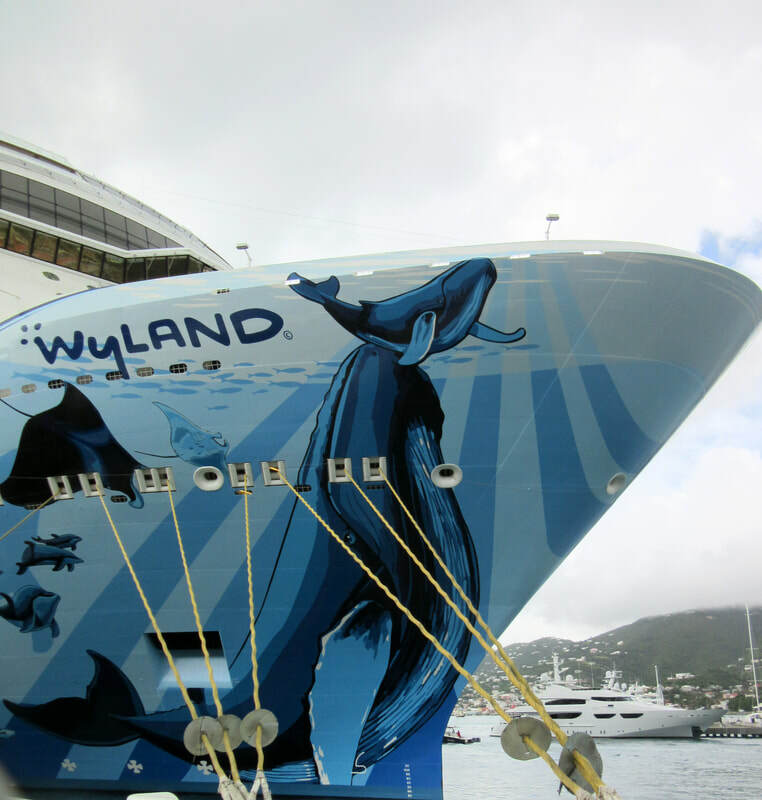 On Bliss, it is a mural of humpback whales by the artist Wyland. 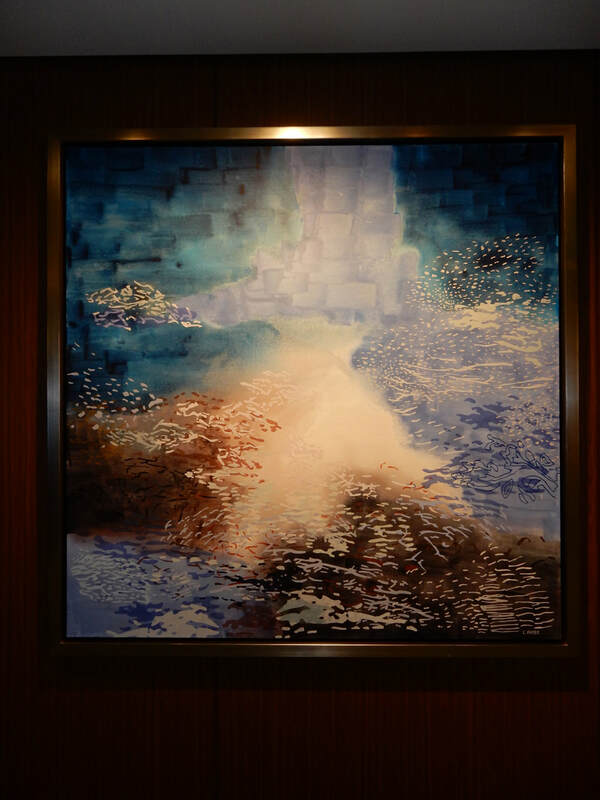 While the decor of Bliss is similar to her Breakaway class predecessors, there is more original artwork. Along the same lines, there is more use of wood-like paneling, which gives the ship a more elegant atmosphere. 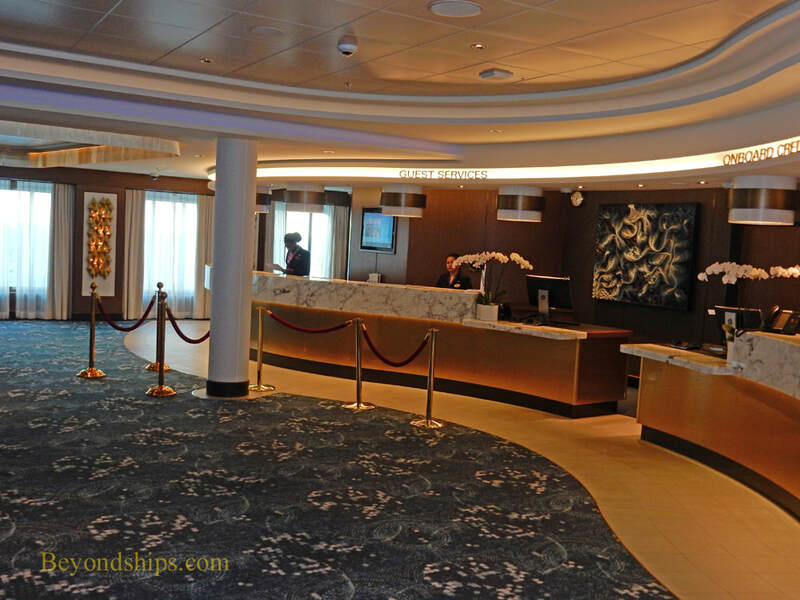 The lobby area includes the Guest Services desk (above), which is similar to the reception desk in a hotel;.the Shore Excursions Desk (above right), where guests can shop for tours in the various ports of call; and the Next Cruise Desk where guests can book future cruises on Norwegian. The configuration of this area is different than on previous Norwegian ships because of the addition of a Starbucks coffee shop to the area.